It's time for some change around here. Not just for the sake of it, but because I've decided that this blog - one of the most visited pages on this site - needs some new functionality. So I've chosen to go to a proper blog format, with comments and a feed. Readers for whom this means something will probably find the new features useful. Others will find that little has changed, other than the appearance, and perhaps the posting frequency - I'll probably make more frequent entries. Feedback on the new format is welcomed; it's not set in stone. Added Feb 2010: And an even newer version of the BLOG IS HERE. Please change your bookmarks if you use them. See also: My blog from January 2006-February 2010. Last night I made the mistake of trying to taste wine while typing notes directly into my laptop. Predictably a glass of wine got spilled onto it. I tipped it upside down, whipped the battery out and tried to get as much wine out as possible. An hour later I powered it up and was relieved to find it works. It smells of stale wine now. Don't try this at home, etc. One of the wines I tried was a Vin de Pays des Côtes de Gascogne white from 2000, sealed with an Integra (injection-moulded synthetic). Why is someone trying to sell this wine? It should have been drunk four years ago. Predictably, it was oxidised. The evening was much redeemed by watching The Island (a clever film, even if it is slightly spoiled by the highly improbably James Bond-like last 40 minutes) and then watching City beat United 3-1. Fantastic. Friday, what a day. Fiona had been pretty ill for a couple of days so we decided it would be good if she saw a doctor. Our GP is useless, unfortunately, so we went to Casualty Plus, a private walk in service that is worth the £39 per appointment. What a surprise when the nice South African doctor (they're all South African, and mostly young -who's looking after the South Africans?) said she needed to get to hospital, quick. Wow. So it was off to West Middlesex, where she was admitted and put on iv fluids and antibiotics. She's now back home, looking a lot brighter. West Middlesex has been rebuilt since I was there for a week having my face taken off and put back on again a few years back, but there's still the same old problem: you can't get the staff. The doctors were fantastic, but the nursing and support staff were just well off the pace, there weren't enough of them and they were completely non-customer-focused. The ENT doctor supervising Fiona was really frustrated that they didn't do what they were told to, so this made looking after patients quite tricky. While she's returning to health, poor old Fiona is off wine for at least another week. That's tough. The wine trade has kicked into action this week as the tasting season was launched with a bang. The Bunch tasting (a collaborative event with Berry Bros, Corney & Barrow, Yapp, Tanners, Adnams and Lay & Wheeler) had plenty of interesting wines, but otherwise it's been all about the Burgundy 2004 en primeur. Loads of merchants are doing tastings. These are great for consumers, because you get a chance to try before you buy. I wish Bordeaux would change their en primeur campaigns and run them on similar lines: the wines would be almost a year further on in their development and punters wouldn't have to rely so much on critics because they'd be able to form their own judgments. I guess I shouldn't be saying this as a journo - after all, the current arrangement suits both journos and the trade quite well. And the 2004s from Burgundy? My initial impression is that it's a pretty good vintage - better than 2003. 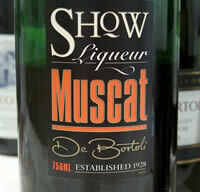 The wines are quite fruity and forward, but with nice typicity, and some are quite serious. It was nice that US publication Food and Wine Magazine recently highlighted this as one of the top wine-related blogs. It’s always rewarding to get a bit of recognition. However, some of the blogging community complained that this isn’t a proper blog because it lacks an RSS feed and comments. It’s true, it’s not a true blog in the sense that it doesn’t use blogging software, but is created like the rest of the site, manually, by me. It would be nice to have an RSS feed and I’d be interested in comments, but this isn’t trivial to implement unless you use blogging software. Most people blog with the likes of typepad, where the blog and the software that run it are hosted externally. This is no good for wineanorak; I’d take a financial hit if I didn’t run adverts on this page, one of the most visited on the site. So, for the last couple of days I’ve been tussling with moveable type, to see whether this is the answer. It’s typepad’s software, but you host it on your own site. And it’s designed for expert technical dudes who know what they’re doing. Installing it means dealing with cgi scrips, permissions, SQL databases, CSSs and all that sort of stuff, and it is non-trivial. So far I’ve got most of it to work, despite having just a skeleton knowledge of the intricacies of what makes modern websites tick. I stopped learning after I’d got to grips with html. But there are some glitches, and I don’t know if I have the time or enthusiasm to pursue this right now. For the time being, you are going to have to stick with the blog the way it is. Tonight was the first night back on the football pitch since before Christmas. It always hurts a bit after a lay-off, and I guess in two days time I’ll be paying the price – strangely, the exercise-induced stiffness takes 48 hours or so to develop. I’m spurred on by the fact that I think I’m getting better still. Sport is fun. I can run hard for an hour after a football, or a tennis ball, or even a tiny rubber squash ball; it’s much harder just to run for an hour with no ball to distract you from the pain message the body is sending. For fitness, I also really enjoy swimming, although not for too long, because it’s an intrinsically boring activity to plough up and down a swimming pool. My theory: it’s good to exercise, but just as with wine and other recreational drugs, you can become addicted and then this takes the fun out of things. Keep it in perspective. Ever spent time with a serious runner? They’re always itching to get out of the house for a run, and will flout well established social conventions in order to feed their need. It’s a socially acceptable addiction – running excessively even has a bit of a cachet with metropolitan sophisticates - but it can screw your life up. Ultimately, exercise addiction suggests a propensity towards narcissism. As I write, I’m celebrating a relatively successful return to the football pitch with some fizz. It’s the Laurent Perrier NV Champagne (£24.99 Oddbins) and it’s rather good. I’m continuing with my exploration of Champagne, and this is up there with the top-notch NV’s I’ve tried in recent weeks. There’s some richness and complexity, but contained within a very fresh, bright package: there’s a clean fruitiness here and good lemony acidity. Very refined. Not as rich as the wonderful Roederer, but just as refined. My only regret is the price. Good Champagne is undeniably expensive. Just a quickie. I'm going to Australia again in March, where I'm involved in a conference (6-9th). It's a long way to go just for this so I'd like to do a few day's wine stuff at the end. I'm happy to take internal flights, which are quite cheap. Has anyone got any bright ideas about how I could spend my time - this might help me make my mind up, something I'm finding difficult to do. I need to book my flights soon-ish. Coffee isn't wine. But I'm going to mention it here because it shares a number of attributes with wine, aside from being a beverage. Significantly, there is a connoisseurship (get that one right without the spellchecker...) associated with coffee that is almost as involved as that with wine. However, while wine geeks just have to pour the stuff, coffee geeks have an instrumental role in making their drink of choice. It's the equivalent of being given the grapes and told to make wine from them. Well, not quite, but you get the idea. My wife has been on a rich vein of form in her present buying in recent months. She's generally an expert gift purchaser (hence I am relieved from a task I'm not the best at), but with my recent birthday and Christmas pressies she has excelled. 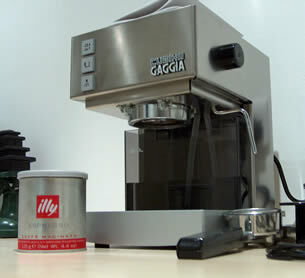 The latter was an espresso maker (pictured). As a non-coffee geek I've been introduced to the new realm of serious coffee, although I'm just taking my first fumbling steps. To make a really good espresso (apparently) you need to grind your own beans, and these beans need to be fresh. Like most wine, the enemy of coffee is air. Ground coffee rapidly loses its myriad aromatic compounds. Really serious coffee dudes complain of roasted beans losing their freshness even when stored in an airtight container in the freezer. For this reason, some people even roast their own beans. To grind coffee for espresso, even I know that a blade grinder is no good. That's a shame, because they are cheap. It needs to be what is called a burr grinder. I don't yet have a grinder of any description. It's complex, isn't it. For the time being I'm using ready ground coffee which I keep in the freezer, but don't tell anyone. It's a bit lull-ish, this period over the new year. In some ways it's quite nice that here, in the northern hemisphere, we don't have Christmas and summer at the same time. I get the impression that in South Africa, Australia and other southern hemisphere nations, each country virtually shuts down because of the coincidence of the two holidays. Nothing wrong with that, other than anywhere nice becomes horribly, impossibly busy. Us northerners aren't forced to take our summer holiday all at the same time, and we get a separate Christmas break too. Since we got back from skiing things have been pretty low key. Lunch with friends yesterday was fun, followed by a twilight walk along the Thames. In the evening we watched the wonderful Shaun of the Dead, a very funny if slightly tasteless film. Today we went back to the river, for lunch at the lovely Minnows in Weybridge. To accompany a rather good mushroom risotto, I drank Leffe Blonde, a deliciously rich-textured Belgian beer with lots of yeasty, tangy complexity. 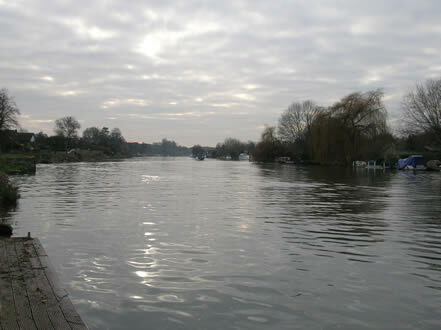 The Thames was quite peaceful today, a reflective grey sort of colour in the weak winter light. I've done a bit of fizz recently. 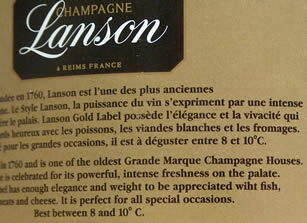 Over the last couple of days we've been struggling to get through a bottle of Lanson Gold Label 1996. It's quite refined on the nose but it's almost impossibly acidic on the palate. It may well age brilliantly, but at the moment I can't get past the acidity. I was also surprised to find a rather obvious typo on the back label (below). Roederer NV consumed on our last day in Switzerland was as delicious as usual. Impressive stuff. Champagne Pommery Maxi-Pop NV is an example of Champagne marketed directly at trendy yoof of the clubbing variety. Nice packaging, but the wine is merely bright, lemony and crisp in a rather simple, accessible style. Pol Roger Rosé 1998 shows a distinctive strawberry edge to the elegant, fresh, taut fruit. This is classy. 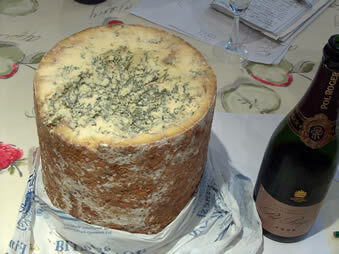 These last two were had at a Boxing day bash at the Beavington's pad (sister and brother-in-law) with the family, where we were treated to an enormous Stilton (pictured below right with a bottle next to it for scale). What will 2006 hold? All things considered, 2005 was a good year. Lots of good things happened, although it presented some tremendous challenges too. I suspect there's no way of insulating yourself from difficult stuff. It's best to accept that life is going to be mixed, and, while it's a bit of a cliché, there are few of us who could survive an easy life without taking a corresponding hit in our character development. New year's eve chez Goode was brought forward a few hours (our kids can't handle staying up late), so by midnight I was sitting up alone watching a re-run of the Ashes highlights sipping De Bortoli's Show Liqueur Muscat. At £8.50 from Majestic this is a complete bargain: it's the real deal, thick, raisined and very sweet, but in balance. For those of you who like Pedro Ximenez sherry, this is very similar in style. The ultimate winter wine. We've been skiing. This is why there hasn't been an update for a few days, for which I apologize. 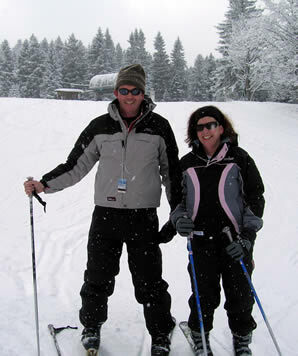 This was the first time our boys had been on the slopes, and it was my first time since Christmas 1999, when on Christmas eve at Megeve, our first day, I snapped the bone in the base of my thumb clean through (it now has a titanium plate in it, attached neatly with six screws). This time we drove to Geneva to stay with Fiona's brother and family at their home in Commugny. 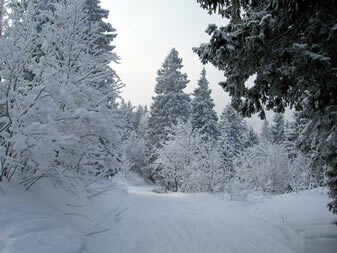 Fortunately, the Jura mountains, which are just 20 minutes drive, had amazingly good snow for this time of year, so we spent our time there. We all had lessons to begin with, and then spent the rest of our time on some delightful easy slopes, including a gentle 3 km descent through the trees. It was very beautiful, and I've survived unscathed. Going down the sides of mountains with bits of fibreglass stuck to your feet is a rather daft and potentially hazardous way of spending your leisure time, but it is tremendous fun if you stick to slopes that are scary good, rather than scary bad. It's an important difference. It's also a way of burning lots of money fast. Skiing gets expensive, once you add all the different bits together. In our case it was a bit cheaper because we didn't have to pay for accommodation and the Eurotunnel crossing was a complimentary one. It's a long way to drive, though, for just three days, and it hurts driving so close to serious wine country (Champagne, Burgundy, Northern Rhône) without stopping off. Still, well worth it for the magic of the mountains. In the evening we've been doing some wine. Gruaud Larose 1999 is actually quite a serious effort, despite the vintage. It's earthy, savoury and tight with good concentration, and will age well over the medium term. Castello di Bossi Berardo Chianti Classico Riserva 2000 is a taut, full Chianti with an intense, slightly medicinal tang to the plummy fruit. Satisfying and reasonably serious. The Abbe Rous Cornet & Co Banyuls Rimage 2003 really appealed to me: this is a sweet Grenache and shows lovely spicy complexity. It's quite Port like, but you can really spot the Grenache with its distinctive varietal character. We've also had a couple of nice Swiss whites, and the remarkable Inniskillin Vidal Ice Wine 2002 from Niagara in Canada - intensely sweet with ripe apricot and tinned mandarin fruit, finishing off with huge acidity. I'm not normally a big fan of icewine*, preferring botrytised wines, but this was quite impressive. *I've always had this sneaking suspicion that icewine was fiercely expensive and sought after merely because it was hard to do - winemakers have to leave a crop on the vine and keep it healthy until the middle of winter. Crushing part frozen grapes yields hugely sweet musts with sky high acidity, which is what you want if you are making sweet wine, but why not do this artificially? The grapes gain very little from being left to hang until mid-December. The wine just gets rarer and more expensive with all the effort.